Background Providing structured information for the understanding of hepatic encephalopathy (HE) might be relevant to the prevention and management of the syndrome. The aim of our study was to design a brief, structured educational intervention and evaluate its usefulness in preventing HE-related hospitalisation over time. Methods Thirty-nine cirrhotic outpatients with a history of HE were enrolled and randomly assigned to an intervention (group A; n=20) or control group (group B; n=19). All of them underwent evaluation of HE (clinical and quantitative neuropsychiatric assessment) and completed the Questionnaire on the Awareness of Encephalopathy. A 15 min educational session was then provided to patients in group A, including basic information on the pathophysiology, hygienic and medical management of HE. Results No demographic/clinical differences were observed at baseline between the two groups. Similarly, there were no significant differences in HE-related information available at baseline between the two groups; knowledge of HE was limited in both. The intervention was highly effective in increasing patients’ understanding of treatment of the condition (from 5% to 80%). The educational intervention also reduced the risk of developing an episode of HE over a period of 12 months. Conclusion The educational intervention confirmed the poor knowledge of patients with previous HE about their condition, served as a tool to increase patients’ awareness, and minimised HE-related readmission rates over a period of 1 year. Patients with a history of hepatic encephalopathy (HE) and their caregivers have limited understanding of HE and its management. The HE educational procedure form (HEEPF), an educational intervention tool designed and tested in this study, increased patients’ awareness and minimised HE-related readmission rates over a follow-up period of 1 year. How might impact on clinical practice in the foreseeable future? This study provides pilot data to design and perform a definitive study on the usefulness of HEEPF. In a recent study, we have observed that both patients and their caregivers have limited understanding of the disease/its management, and we have suggested that this may be the consequence of insufficient provision of information.7 Therefore, providing structured information for the understanding of HE might be relevant to its prevention and management. Based on this hypothesis, the aims of this study were: (1) to test the awareness of HE in a group of patients who had had a previous episode of HE≥grade II; (2) to validate a short educational procedure for these patients; (3) to provide a preliminary assessment of the efficacy, if any, of an educational intervention to prevent HE-related hospitalisation (HE≥grade II) over time by a prospective randomised intervention study. Patients were excluded if they were under 18 years of age, had misused alcohol in the preceding 6 months, had a history of head injury, cardiovascular/cerebrovascular disease, neurological/psychiatric comorbidity, were taking psychoactive drugs or were unable/unwilling to comply with the study procedures. A total of 12 outpatients declared they had habitual caregivers who were relatives. The study was planned to be completed in 2 years and had a prospective randomised intervention design. Over this period of time, we were able to enrol 39 outpatients with cirrhosis, who were randomly assigned to one of two groups (by random numbers generated from a computer): group A, undergoing the educational intervention (n=20), and group B, not undergoing the educational intervention and serving as controls (n=19). The educational intervention was based on commenting three cartoons (HE educational procedure form (HEEPF)) including: (1) basic information on the pathophysiology of HE; (2) education on how to ensure/maintain regular bowel emptying; and (3) drugs used to treat HE with a simple explanation of their mechanism of action, pharmacological and commercial names (figure 1). The educational intervention was planned to be completed in approximately 15 min. The intervention was designed with a view to inform/educate the patient on manoeuvres and decisions that can be made without the intervention of a doctor, thus changes in the dose of diuretics and introduction/tapering of psychoactive drugs were not covered. Hepatic encephalopathy educational procedure form. Within 1 hour of the educational intervention, patients completed a questionnaire designed to check if they were satisfied with the information received and if they had acquired novel information (Novel Information Questionnaire (NIQ)) (table 1). Both the HEEPF and the NIQ were designed for purposes of this specific study, and they are presented and described in table 1 and figure 1, respectively. A computerised version of the Sternberg paradigm test was also administered.13 Thirty-six consecutive pairs of numbers, with or without common digits, were presented on a computer screen, and subjects were asked to press 1 on the keyboard if there were common digits (ie, 5632 and 694) and press 3 if there were no common digits (ie, 41 and 75). Both accuracy (% correct responses) and reaction times (ms, adjusted for accuracy) were obtained. Finally, an overall age-adjusted and education-adjusted z score was obtained, with reference to local normative values. Patients were telephoned monthly for 12 months, and they were asked if they had had HE-related admissions. Information was verified, where possible, on clinical notes and hospital records. The study was approved by the Padova University Hospital Ethics Committee, and all participants provided written, informed consent. The study was conducted according to the Declaration of Helsinki (Hong Kong Amendment) and Good Clinical Practice (European) guidelines. Demographic, clinical and neuropsychiatric variables distributions were tested for normality using the Shapiro-Wilk’s test. Differences between groups were performed by the Student’s t-test/Mann-Whitney U test, as appropriate. Analysis of the effectiveness of the educational intervention was performed using the Fisher’s exact test for proportions. Survival analysis was performed using both monovariate (Kaplan-Meier) and multivariate models (Cox’s regression). Incidence was expressed as the number of events per year per 100 patients. The sum of the follow-up for each event to occur was computed. Then, the sum of the events and the sum of the observation time for the events to occur was computed. This value was normalised for 1 year and for 100 patients. Demographic and baseline assessment parameters are presented in table 2. There were no significant differences between groups A and B in any of the demographic, hepatic failure, neuropsychological and neurophysiological variables. Similarly, there were no significant differences between groups A and B in QAE results. In detail, 30 of the 39 patients (77%, 95% CI 62 to 87) were aware of previous HE, 16 in group A (80%, 95% CI 58 to 92) and 14 in group B (74%, 95% CI 51 to 88). However, only three patients in group A (15%, 95% CI 5 to 36) and two in group B (11%, 95% CI 3 to 31) were able to correctly identify the medication used to treat/prevent HE. Furthermore, only one patient in group A (5%, 95% CI 1 to 24) and two in group B (11%, 95% CI 3 to 31) had adequate understanding of the expected treatment effects. Twelve (60%, 95% CI 39 to 78) patients in group A declared they were satisfied with the HEEPF and 11 (55%, 95% CI 34 to 74) had actually acquired novel information on the pathophysiology of HE. Of the eight (40%, 95% CI 22 to 61) patients who declared that the intervention had not been useful to them, one (5%, 95% CI 1 to 24) already had adequate information at baseline, five (25%, 95% CI 11 to 47) had not actually acquired new knowledge on their condition, and 2 (10%, 95% CI 3 to 30) had acquired new knowledge on their condition despite declaring the opposite. Thus, in 13 (65%, 95% CI 43 to 82) patients the intervention provided novel information and 14 (70%, 95% CI 48 to 85) had adequate knowledge at the end of the educational procedure. In relation to prevention/treatment of HE, 16 patients (80%, 95% CI 58 to 92) belonging to group A declared they had received novel information, and 4 (20%, 95% CI 8 to 42) declared they had not. Out of these four, one (5%, 95% CI 1 to 24) already had the information at baseline, and 3 (15%, 95% CI 5 to 36) had not actually acquired new information on prevention/treatment of HE, despite the HEEPF. Thus, the intervention was highly effective in increasing expertise on HE management, improving knowledge from 5% (95% CI 1 to 24) preintervention to 80% (95% CI 58 to 92; p<0.001, Fisher’s exact test) postintervention in group A. 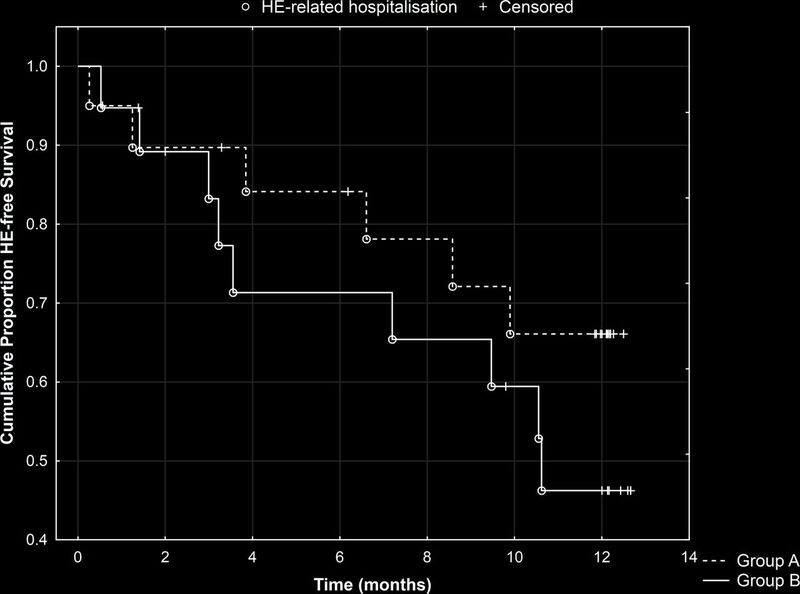 During the 12-month follow-up period, patients in groups A and B suffered a total of 6 and 9 episodes of HE≥grade II requiring hospitalisation, respectively. The precipitating causes of HE were infection (n=2), dehydration (1), constipation (1) and unknown (2) in group A, and infection (3), constipation (2), and unknown (4) in group B. The incidence of events was 20.8×100 patients × year versus 48.8×100 patients × year in groups A and B, respectively (figure 2). These results allow us to estimate that about 80 subjects would have been required to reach 80% power. Cumulative proportion of HE-free patients over time by group (A=intervention; B=no intervention). The risk of HE-related hospitalisation in group A was HR=0.58 (95% CI 0.21 to 1.62; p=0.29). 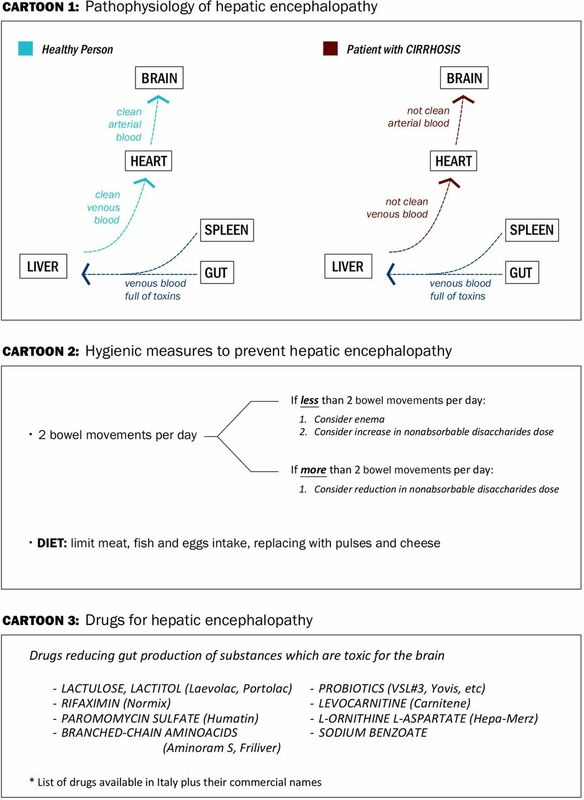 HE, hepatic encephalopathy. Older age, poor liver function and poor psychometric performance (abnormal PHES) were associated with increased risk of HE-related hospitalisation, while fast EEG activity was associated with reduced risk of HE-related hospitalisation (table 3). By using multivariate backward Cox’s model to adjust for these variables, which reflect the severity of the patients’ clinical condition and may have acted as confounders, the educational intervention was shown to reduce the risk of HE-related hospitalisation over the follow-up period (HR=0.14, 95% CI 0.02 to 0.77, p=0.02). A structured educational session (HEEPF) providing information on HE pathophysiology, prevention and medical treatment was designed, with a view to help preventing HE-related hospitalisations. The usefulness of such programme was immediately evaluated by means of NIQ, and over the subsequent 12 months by a monthly telephone interview, to check for the occurrence of HE-related hospitalisations. Importantly, when the results were corrected for the severity of the clinical condition, HEEPF was shown to reduce the risk of HE recurrence over time. This was despite the high absolute number of HE events over the follow-up period. Although well-informed patients in group A could have avoided precipitant factors such as constipation or dehydration, factors such as infection or bleeding are obviously more difficult to prevent/control. Nonetheless, the number of ‘avoidable’ precipitants in both groups was similar. The fact that the AASLD/EASL Practice Guideline on HE4 strongly encourages definition and recording of HE precipitants may help with similar studies in future, by way of clearer and better information in this respect in notes/medical records. In addition, the AASLD/EASL Practice Guideline4 highlights the importance of the education of both patients and their relatives/caregivers. Caregivers have a crucial role in the healthcare process once the patient is discharged,4 hence new tools are being designed to help them detect episodes of HE.19 Similarly, the HEEPF could have been administered to both patients and their caregivers, or even only to caregivers. Indeed, one of the initial aims of the present study was to involve caregivers. However, very few patients were accompanied on the day of study, making enrolment impossible. provides pilot data to design and perform a definitive study on the usefulness of HEEPF. Future research is also needed to characterise the features (ie, precipitants and others) of the HE with the highest likelihood of benefiting from the educational approach in terms of prevention.
. Hospital costs, length of stay, and readmission rates in a cohort of cirrhotic patients discharged with hepatic encephalopathy. Hepatology 2013;58:390A–1.
. Coordinating care: an elusive but critical goal. Managing chronic illnesses during transitions presents tough challenges. Health Prog 2009;90:32–5. Contributors MT, CF, MC, MDR and SM assessed the patients and performed the study. MG, CF, SM and PA analysed the data and drafted the manuscript. SM and PA designed and planned the study. SM is responsible for the overall content as guarantor. Funding The work was partly funded by a grant from the Italian Ministry of Health to SM (Giovani Ricercatori 2009-1604309); MG was funded by a research postdoctoral fellowship from Gobierno de Extremadura (jointly financed by the European Regional Development Fund (ERDF); ref. PO14013). Ethics approval Padova University Hospital Ethics Committee.